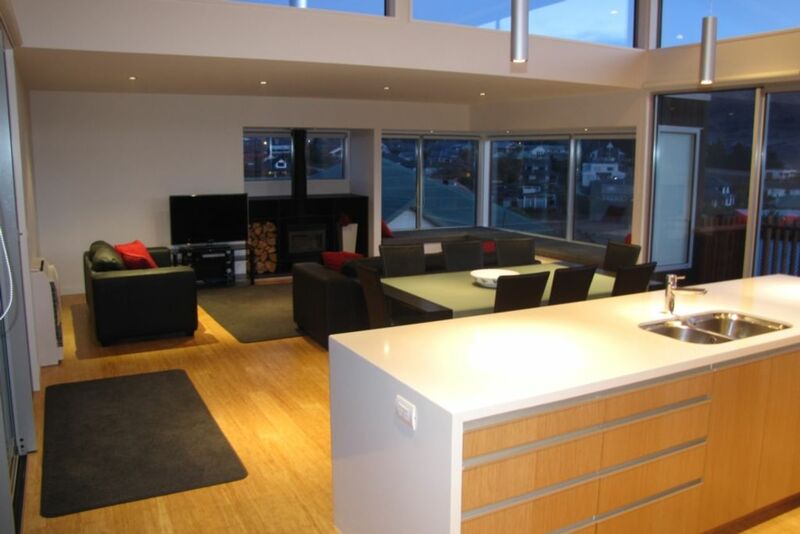 This brand new, highly appointed, architecturally designed house is now ready to be enjoyed. With four bedrooms and two bathrooms your group will have plenty of space. Fantastic lake and mountain views are available from all living areas. Close proximity to large playing fields and playgrounds will be great for guests with children. The house offers generous open plan living through the lounge, dining and kitchen area which flows out onto a balcony and courtyard. The views from the balcony are magic. The double garage offers generous parking with further off street parking available (for cars or boats). Heating consists of a Wood Fire and two heat pumps. Free high speed internet and Sky TV is an added bonus. Centrally located, only 10 minutes walk to the centre of town. Can comfortably accomodate two families. Situated right behind our other property "Simply Stunning I", subject to availability, larger groups could book both houses and accomodate up to 16 guests. “Fantastic house, amazing views, and a real treat to stay here, thanks” Jo and Hayden. A linen fee and/or cleaning fee may apply for shorter stays or larger groups. Offstreet parking for 2 vehicles plus garage. Lots of street parking also. Two great nearby fields being Cardrona & Treble Cone. Extremely well presented home. Can’t wait to stay again. Great location and views. Had everything we needed to be a home away from home. Spacious with a dreamy view, we loved our stay. Stunning house comfortably slept two families. Great location. The property has everything you could possibly need. Attention has been paid to detail. Communication all the way 100%. Plenty of room. Loved the gift of wine on arrival. Fittings and kitchen ware 100%. Proper crystal wine glasses. We enjoyed every minute. The view was simply stunning. Not a long walk to the main street. Would definitely go back again. Thanks Pete. The house was fabulous we loved the location...just a quick walk through reserve to get to town. The heating was great having options to either use heat pump or fire... especially for us when we don't have a fire so it was a novelty. Overall would recommend this property to anyone and would love to come back again. Thanks for your feedback, we love to hear when our guests have had a great stay.